Wealth: Spend it all or gift it all… BEFORE you die! As a successful orthopedic surgeon and serial entrepreneur, Dr. Stanley Riggs has been building wealth for over fifty years through several very different and very successful careers, each of which made him a multimillionaire. Through his new book, Build Wealth & Spend It All, Live the Life You Earned, Dr. Riggs explains the three basic financial concepts anyone can understand – assets vs. liabilities, economic cycles and demographic trends – rather than just explain how to become rich. The book teaches you how to start to build wealth, protect your retirement savings and plan to strategically and responsibly spend it or gift it all away before you die. In his new book, Dr. Riggs presents a logical plan of how to do this over a predetermined period of time, before the private 401(k) plans are nationalized and redistributed to bail out the underfunded municipal retirement programs. It is a smart and carefully executed way for you to enjoy spending it all before they take it away. Build Wealth & Spend It All will help you climb the “net worth mountain” and enjoy the view from the top. It will be your guide as you descend, strategically spending and gifting away every single dollar you have earned and saved. Dr. Stanley Riggs received his Bachelor of Science degree from the University of New Hampshire, his MD degree from Dartmouth Medical School, and completed his orthopedic surgery residency at the Mayo Clinic in Rochester, MN. While establishing and managing his private practice in Florida, he developed and managed his own commercial real estate portfolio. With his self-taught knowledge of real assets versus liabilities, economic cycles and demographics, he was able to build successful careers in the residential, commercial, industrial and resort asset classes by staying ahead of the national economic trends. 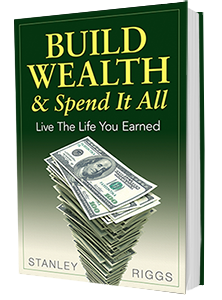 Build Wealth & Spend It All is scheduled to be released on November 1, 2014 and can be preordered from amazon.com and through all major booksellers. It is also available in digital format. Donec sagittis dapibus feugiat. Nam laoreet massa non odio tincidunt accumsan sed nec dolor. In ultrices lectus at mauris semper, vel aliquam nisi ultricies. Aliquam justo metus, facilisis in bibendum vel, commodo ac neque. Mauris nec lorem dignissim, placerat nibh sed.